Info: 2 BR, 2 BA, Beachfront Home w/bunks w/ over 1150 square feet. Exceptional views of the Gulf of Mexico from this Lighthouse condominium home in Gulf Shores. This beach home is well decorated and has 2 bedroom, a bunk room and 2 baths – the complex is among the most popular real estate developments on the Alabama Gulf Coast. This condominium home has been exceptionally well maintained and includes numerous upgrades such as granite counter-tops and tile flooring throughout. 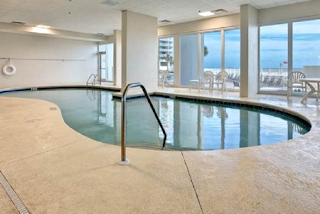 Lighthouse is a beachfront complex with resort style amenities – two outdoor pools, two hot tubs, an indoor pool, an exercise facility, a sauna, outdoor grills, on-site management, covered-parking; the property is within easy walking distance to Gulf Shores dinning, entertainment and shopping. Tour the resort home and see why this home is so special…visit Gulf Shores Alabama and Lighthouse Condos. Gulf Shores Alabama is a popular family beach vacation destination, the warm climate allows for an abundance of outdoor activities, dolphin cruises, championship golf courses, bird-watching, deep-sea fishing charters and nature hikes. for accommodations, choose from national hotel and motel chains, camping or a variety of beach homes for rent by owner and/or management companies. There are numerous Gulf Shores venues for nightlife, from family entertainment to a legendary roadhouse, enjoy from a selection of plays, concerts, dancing or just relaxing while listening to local musicians.When hunger strikes, enjoy one of many Gulf Shores eateries offering some of the best seafood anywhere...fried, grilled, steamed, blackened, etc. Whether you’re ready for fun and adventure, a carefree day on the beach, or a succulent meal - you can find it all on Alabama’s Gulf Coast.